Introducing Movements of Asia. A home grown Singapore brand. 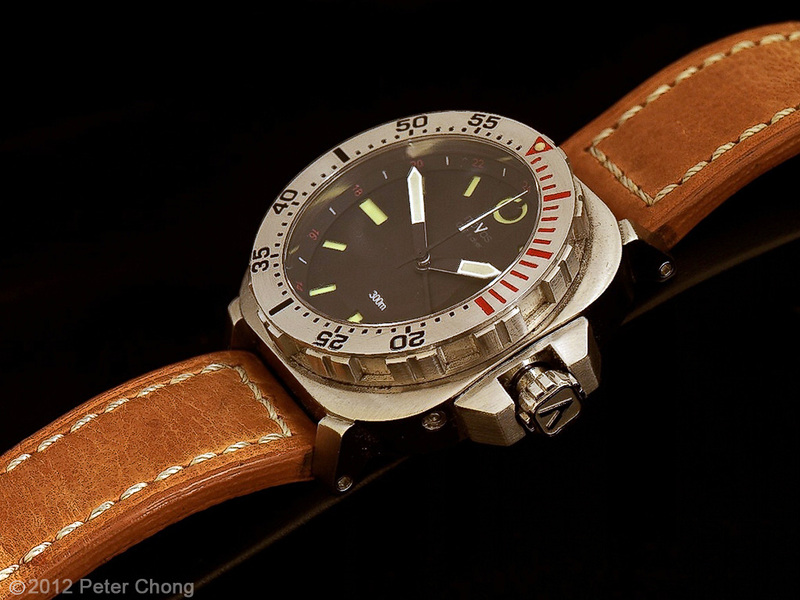 Designed by Sean Wai...a tactiturn architect turned watch brand do-it-all in Singapore, assembled in Singapore with Chinese parts. I first came to know Sean from his other hobby company...Soul Bikes. The only titanium bicycle frame brand to be based in Singapore. The frames are completely designed inhouse by Sean, but fabricated in China and Taiwan. When I visited to talk bikes, I noticed he had all these interesting watches lying around...and found that he also designs watches. 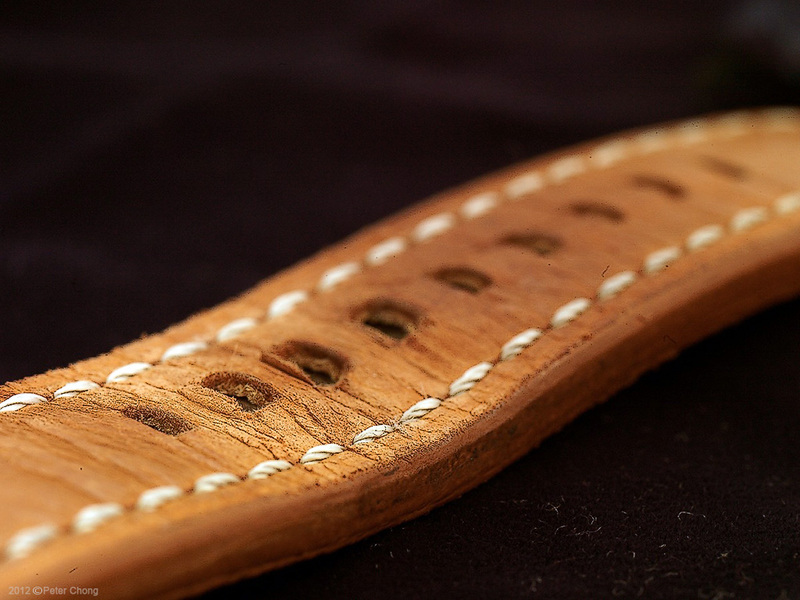 Designed as tough, sporty watches...the watches are quite highly specified. Shown here is the GMT2 model in massive (I really mean massive) stainless steel case measuring some 45mm. I rather like the menacing styling and massive-ness of the watch. 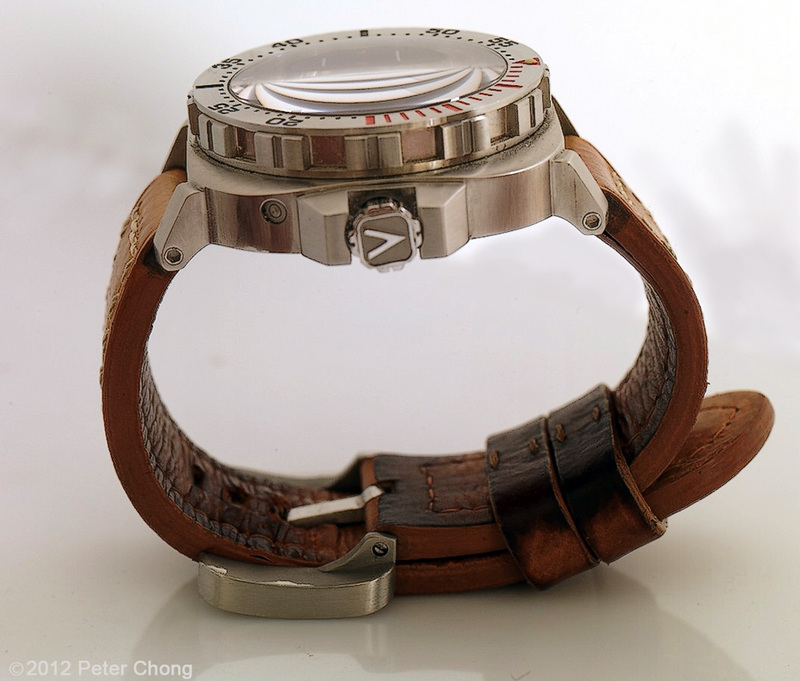 The movement is Chinese made Hangzhou running at 28800 bph, protected in a case designed and tested to 300m. The watch shows dual timezone, and a sweep seconds hand with a date. I found the date too small to be read...and as this is diving watch, would prefer not to have a date...in any case one so small is useless. The sapphire glass, with anti reflection treatment on the inside of the glass is some 4mm thick. The bezel, to accomodate the massive glass is equally thick and massive, but has a reassuringly confident click. 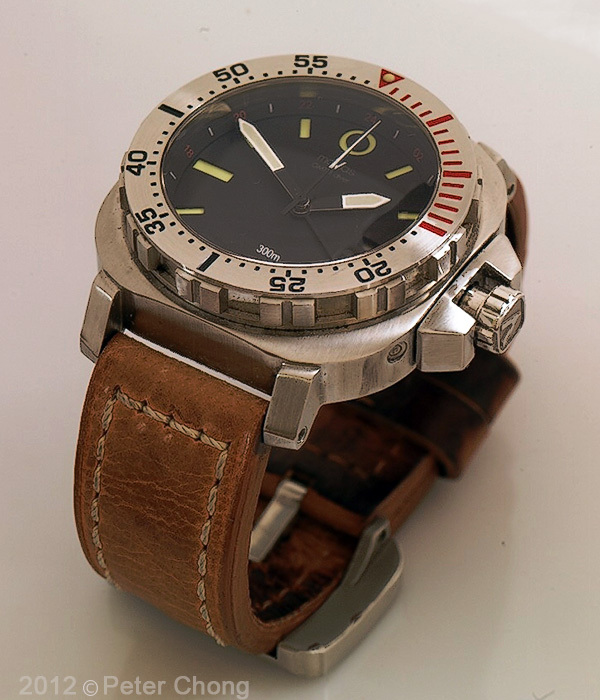 The bezel can be moved unidirectionally in half minute increments...the 120 clicks being quite unique, as most dive watches have only 60. The crown is massive, and treated with the same design language as the bezel...large cog like structures, which allow it to be gripped by gloved fingers. Perhaps the design is for it to be operated by gloved fingers, but I found the crown's ridges to be a bit sharp, threatening to rip my fingers when I unscrewed it to adjust the time. 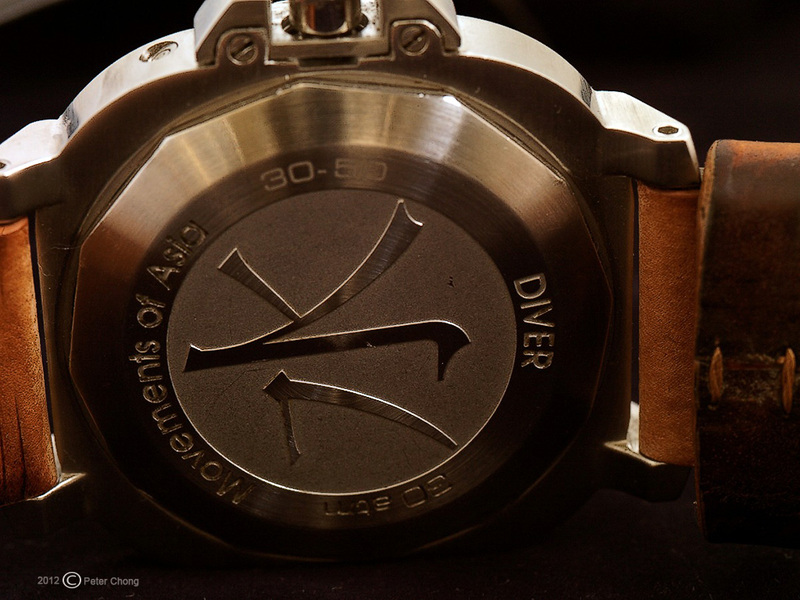 The caseback is engraved with a Chinese character meaning "water", and with the model designation and the water resistance of 30 ATM. 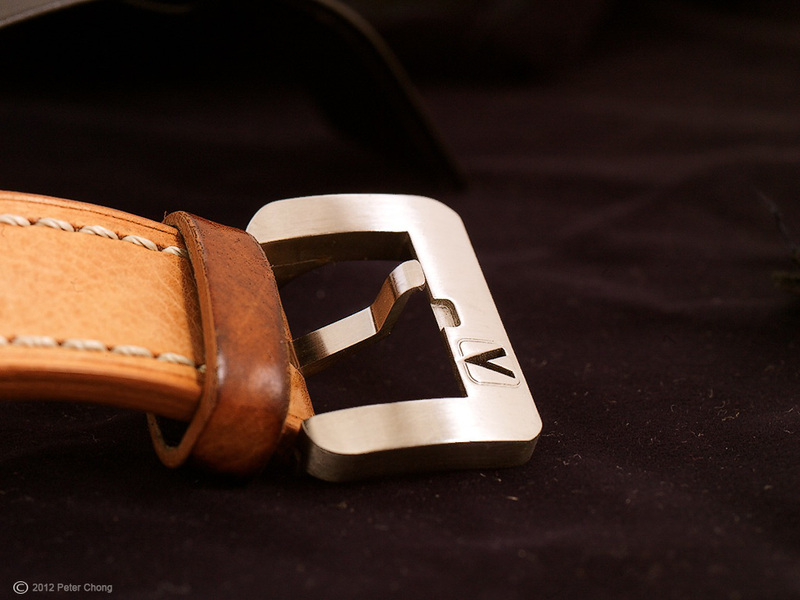 As a designer, Sean put out his personal touches, and the buckle is an inhouse design, featuring a notched v, again, massive. The watch is available with a stainless steel bracelet, but I quite liked the sample watch loaned to me which was made in thick leather. The patina, I found to be quite beautiful after a bit of use. Very sporty design...massive (I know I said that several times, but this is the predominent feel I get with the watch). Quality is quite high, though I did not see the movement, I was assured by Sean that he decided to assemble the watches in Singapore because after the intial experience of having the entire watch manufactured in China, he preferred to do it himself to assure quality. Price? A reasonable US$600. At this price, I would think it good value for money...and would compete effectively with the Sinn, Tutima, and Seikos of the world. Available in bead blasted matt finish as shown or with DLC black pvd. Contact Sean Wai at Movements of Asia for more details. Great review, and sweet pictures. 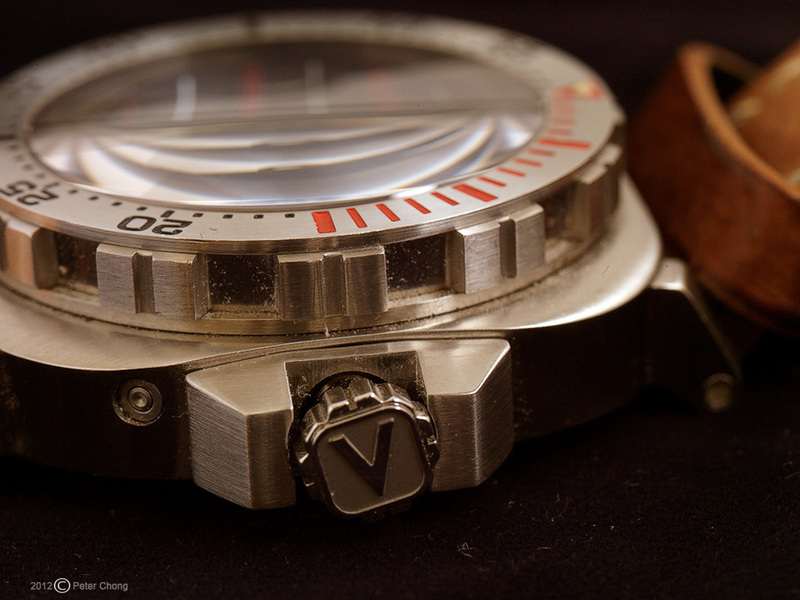 I like the look and aesthetic of this diver. I have two on the way to me. I can't wait to see them in the flesh.